Chicken Jhola is a very light Chicken curry for a busy weekday light dinners or a rush free weekend cooking. Somedays I don’t feel like cooking and cleaning. While I want the day to be stress free, takeouts are never in my mind. So, cooking something that’s light on tummy and made with ease is always a pleasure. Though the main ingredient is Chicken I cannot afford to cook it everyday greasy and spicy. It was a lazy Sunday with a normal overcast of Seattle weather. It was packed up with the cleaning of entire house, changing sheets, doing laundry. And cooking was not at all in my mind today. But there was a little toddler hopping around with all his demands and the man of the house wanted something better as it’s a weekend and nothing more easy than this Chicken curry could come to my mind. I marinated the chicken for just 30mins and the cooked it for around 30 mins. This light chicken curry is best enjoyed the Indian way, either with few ghee smeared rotis or bowl of hot steamed rice or jeera rice. During winter this mild Chicken curry or stew is a pleasure and comfort and keeps cold at bay. Sometimes I add large chunks of Potatoes to make it more filling or wholesome but today I made it without them. Marinate the Chicken with Turmeric Powder, Red chilli Powder and Salt and keep it aside for 30 mins. Make a course ground masala from the cubed onions, cumin seeds, coriander seeds and red chilies and keep it aside. Take a wide bottomed vessel, and heat for a minute or two. Add Mustard oil, you can use your choice of oil and palate. I added for my pure Odia taste. To the hot oil, add the sugar, this is a bit of trick to make the gravy look bright red, it won’t make the curry sweet. Then add the whole garam masalas (bay leaves, cinnamon stick, cardamom pods) and saute till the aroma is released to the oil. 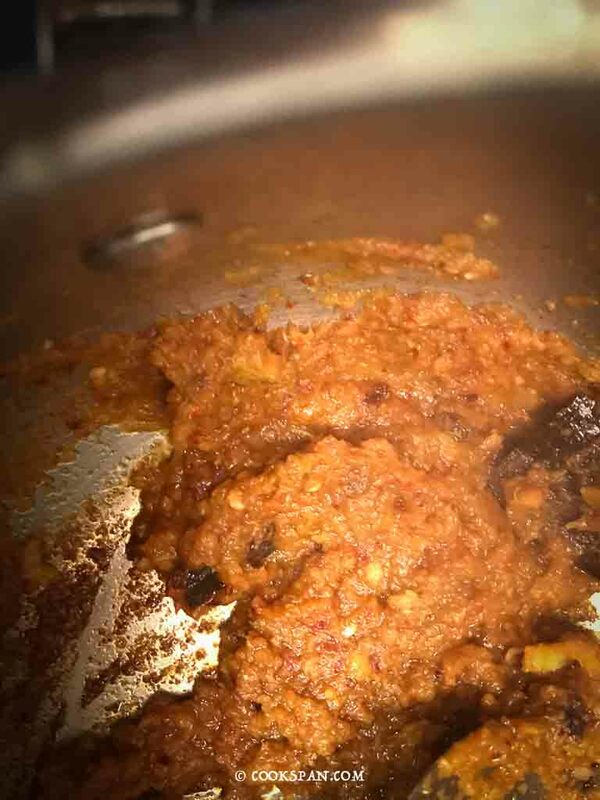 Now, add the coarsely ground masala and ginger garlic paste together and cook it till the oil separates and the raw smell of ginger, garlic and onion goes off. This nearly takes around 5-6 mins. To the masala mixture add the tomato puree and cook till the oil separates. Add the marinated chicken and mix the cooked spices thoroughly and cover and cook in the medium flame for about 10-15 mins. Now roughly chop the half bunch of coriander leaves and add to the semi-cooked chicken. This adds the best flavor to the gravy. Cook till the chicken is entirely done. You can add the amount of water you want based on the need of the gravy. But as I wanted a light curry. I added 2 cups of water and let it shimmer. Finally added the garam masala and cook for a minute.